I was invited by Marilou Gallarde to accompany her to Gilutongan Island, a small (15.3 hectare) pile of rock located in the Bohol Strait about 10 miles east of Cebu City. 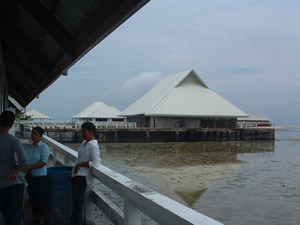 Legally, the island is a barangay of Cordova Municipality, located 3 miles to the west on Mactan Island. Formerly a fishing village surrounded by seas teeming with marine life, Gilutongan's nearby reefs were degraded by a combination of overfishing and reef destruction caused by fishermen using dynamite and cyanide. In 1990, part of the reef surrounding the island was designated as the Gilutongan Marine Sanctuary (GMS) in order to protect what was left. Gilutongan today is a tourist destination for divers, and an island of poverty for the residents. Gilutongan has a population of 1300, living in 212 households. 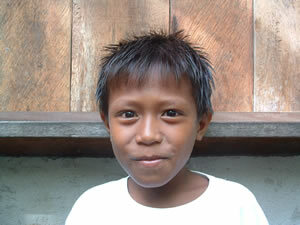 Of 600 children, about 150 are malnourished. 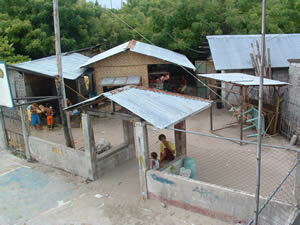 Islanders live in mostly small, metal-roofed wooden houses with electricity provided 4 hours per day by a diesel generator (residents are charged 20 pesos each per day for its fuel). There are no telephone lines, no human waste management system, no garbage collection, no health care services, and very limited opportunities to make money. There is no potable water supply; residents pay 15 pesos per 5-gallon Jerry can for water (expensive for poor people! ), carried over from Mactan Island on pumpboats. 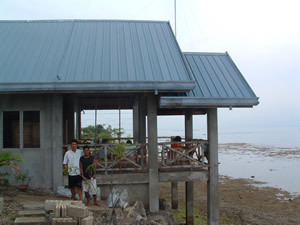 Gilutongan's poverty, overcrowding and absence of resources are common to most if not all small islands in the Philippines. However, Gilutongan is luckier than many in that a variety of international foundations and aid agencies, and even Philippine government agencies, have initiated aid and development projects on the island. The umbrella group is the CCE Foundation (Coastal Conservation and Education Foundation, Inc.) Funded by the Coral Reef Alliance, the David and Lucile Packard Foundation, the Pew Fellows Program and PATH (Programs for Appropriate Technology in Health), CCE seeks to "promote the protection, management and sustainable use of the marine environment for the benefit of people throughout time." - Using mass media and targeting campaigns to increase the puclic and policymakers awareness of population-environment links and solutions to issues related to such. 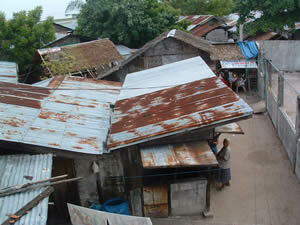 The island still does not have its own health center or health personnel. As part of the IPOPCORM program, Marilou has secured funding for a midwife to live on the island and to provide pre-natal and birth services. The barangay captain has agreed to allow the midwife to set up a small clinic in the 2-story barangay hall, but the avaiable room is dirty and missing windows. Marilou has been hustling to secure a budget for renovation of the clinic room, so that the midwife can get to work providing health services. 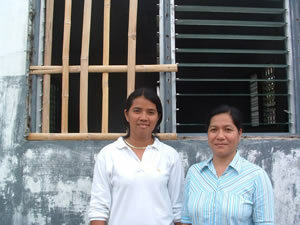 Merlinda Silos, midwife, with Marilou Gallarde at the site of the planned Barangay Health Center. 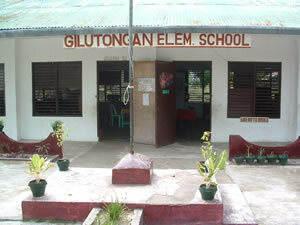 Classes were in session at the Gilutongan Elementary School. Most children on the island stop after graduating from elementary school: boys to join their fathers in fishing, and girls frequently to start their own families. Many, like these boys playing in the schoolyard, never attend school. 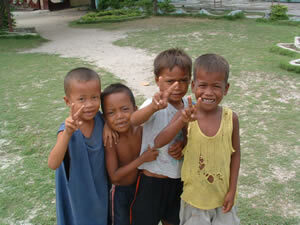 They appear very small for their age, due to chronic malnutrition. 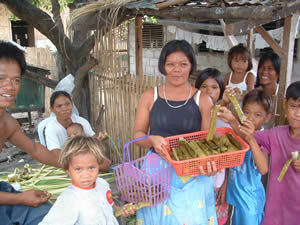 One of the IPOPCORM projects components is EED (Environment-friendly Enterprise Development.) The beneficiaries are provided amaximum loan amount of 4,000 pesos, and simultaneously encouraged to participate in a weekly savings program, by saving a minimum of ten pesos. This is to develop discipline in savings, because there are no banks there. The EED collector comes weekly to collect both loan payments and savings deposits, which are deposited in the bank and can be withdrawn by the beneficiaries in times of crisis. Wilson is another micro-credit loans recipient, who has started a small bakery (the island's first.) 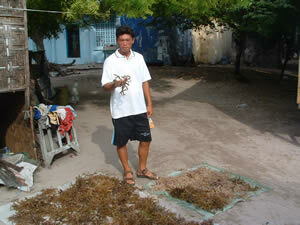 Here he holds some seaweed being dried by one of Gilutongan's seaweed farmers, who are also micro-credit loans recipients. Fishermen no longer able to support their families with fishing because of plummeting fish stocks have enthusiastically adopted this means of livelihood. The seaweeds are dried and delivered to Cebu, where they are processed into carrageenan, a multi-purpose ingredient in processed food, cosmetics, medicines and other products. The 15 hectare Gilutongan Marine Sanctuary (GMS) is located off the west side of Gilutongan Island. It was established by municipal ordinance in 1991. 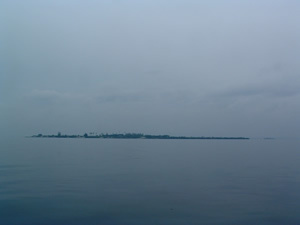 In 1996, the municipality of Cordova entered into an agreement with the DENR-USAID (Philippine Department of Environment and Natural Resources / United States Agency for International Development) CRMP (Coastal Resource Management Project) for the latter to mainstream coastal resource management (CRM) as a basic service in the municipality. The sanctuary is managed by the community, from patrolling the waters to doing periodic reef checks to family planning education. It has a very successful eco-tourism program that charges user fees to divers, having brought in some two million pesos in fees during 2003. Part of that money has gone back into community development, including the construction of a guardhouse near the sanctuary (see photo) and the installation of solar power to operate the telephone which can be used to call law enforcement agencies in case of poacher sightings. But likewise, island residents are aware that tourism carries also risks. 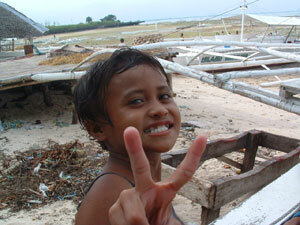 According to Marilou, girls on nearby islands with similar tourism development have entered prostitution. And what will be the other effects from visits by wealthy tourists sporting cellphones and cash? Unfortunately, I didn't get to meet Toti Menguito, guardian of the Gilutongan Marine Sanctuary. He was previously a local fisherman who had watched fishing catches drop dramatically in the years prior to establishment of the sanctuary. He was an early proponent of action to protect the fishing grounds, and was instrumental in the establishment of the preserve. He was attending a meeting in Cordova the day I visited. Next we visited the Island and Sun Beach Resort, described by its website as "an island retreat combining natural beauty with casual elegance, modern comforts and fabulous cuisine." It offers "Deluxe Room Package rate" for $258 U.S. per day. -Check out time is 12 noon. ...and I noticed that there were no guests staying there when we visited. What does the future hold for the children of Gilutongan?